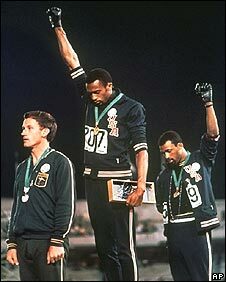 Tommie Smith and John Carlos gave a gloved Black Power salute on the Olympic podium in October 1968, the story has now been told about the 3rd man on the podium...humanity shines through...need to see that documentary Salute. "It was Norman who, when John Carlos found he'd forgotten his black gloves, suggested the two runners shared Smith's pair, wearing one each on the podium. And when, to the crowd's astonishment, they flung their fists in the air, the Australian joined the protest in his own way, wearing a badge from the Olympic Project for Human Rights that they had given him."